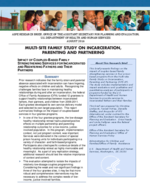 This brief summarizes findings on the impact of couples-based family strengthening services in four prison-based programs from the Multi-Site Family Study on Incarceration, Parenting and Partnering (MFS-IP) and discusses the implications for policy, programs, and future research. In one of the four grantee programs, the low-dosage healthy relationship retreat had sustained positive effects on multiple partnership and parenting relationship outcomes for a low-income, justice-involved population. This evaluation attempted to isolate the impacts of relatively low-dosage couples programming. Considering the weak and non-significant findings in three of the four grantee sites, it may be that more robust and comprehensive interventions may be necessary to address the complex needs of low-income, justice-involved families.